This is the fifth installment in a series of posts on California's climate leadership. These posts address a wide range of related topics including economic benefits, renewable energy, electric vehicles, and cap-and-trade. California Governor Jerry Brown is emphatic in his conviction that fact-based appraisals of the implications of climate change are essential. Although Brown is aware that fear causes many to turn away from climate impacts, as all responsible leaders should, he welcomes the facts as they are, not as he would like them to be. Facing the truth about climate change takes courage and Brown has that kind of courage. "Most people don’t want to think about catastrophe, I am not one of those people. I like to think about catastrophe." Sea level rise is the biggest climate threat faced by California. The economic toll of sea level rise alone convincingly makes the point that climate change will incur trillions in costs. A recent 71-page study indicates that sea level rise will indeed be catastrophic in California. As reported by Kurtis Alexander in SF Gate, the report predicts that the Bay Area will see 3.4 to 10 feet of sea level rise by end of the century. The melting of the Antarctic ice sheet could raise ocean levels by a staggering 187 feet. This has especially dire implications for California which is subject to disproportionate impacts from melting ice at the south pole. The research suggests that for every foot of global sea-level rise caused by melting ice in the western Antarctic, California will see an addition 25 percent increase. California is trying to address the threat head-on. There is a statewide policy on sea-level rise that offers guidance to state agencies and local governments that assist with planning, permitting, investment, and other decisions. 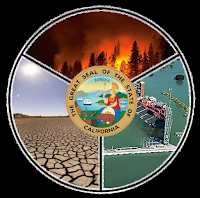 California has suffered from catastrophic drought and even thought the drought conditions have abated there is an ongoing groundwater problem associated with extensive irrigation. This finding is corroborated by a NASA report that noted an acceleration in the speed at which the ground is sinking. This is associated with groundwater pumping in California’s most productive agricultural regions. The costs of drought extend beyond agriculture. A six-year drought led to the unprecedented death of more than one million trees. As reported in the San Francisco Chronicle more than a million tree deaths have been recorded by the aerial survey. In total, 7.7 million trees have died accounting for more than one-third of all the trees in the state. Dead trees have contributed to the record-setting number of forest fires in California. Climate change is exacerbating the number and size of forest fires. Increasing temperatures and drought have produced a lot of fires in the Golden State and the situation is getting worse. According to CNBC, three times as much acreage has burned so far in 2017 compared to last year. About 2,300 wildfires have burned 25,000 acres so far in 2017, according to government statistics. As of the writing of this article, there are eleven fires burning in California. Four of those fires (the Manzanita fire, the Mart fire, the Hill fire, the Placerita fire) have consumed almost 10,000 acres. It is little wonder with temperatures hovering around 110 degrees Fahrenheit in some place.